258th day of the year. There were then 107 days left in 2018.
on the 37th week of 2018 (using US standard week number calculation). 87th day of Summer. There were 7 days left till Fall. 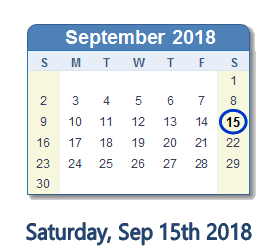 What happened on September 15th 2018? Michael Barone: If Democrats can’t run Chicago, can they run anything? I'm half "Speak it into existence" and half "Shut up don't jinx it."